Clarify 2Additional ResourcesClarify-it.com How-tosHow do I keep Google from indexing documents I share? Every document you share on Clarify-it.com includes a header that tells Google and other search engines not to add your page to their indexes. In addition, no services are notified when you create a new document. The only way for someone to view your document is for you to give them the unique, random url that is generated when you create your document. Can I password protect a document? No. But unless you send the url for your document to them they will not be able to access it. No. 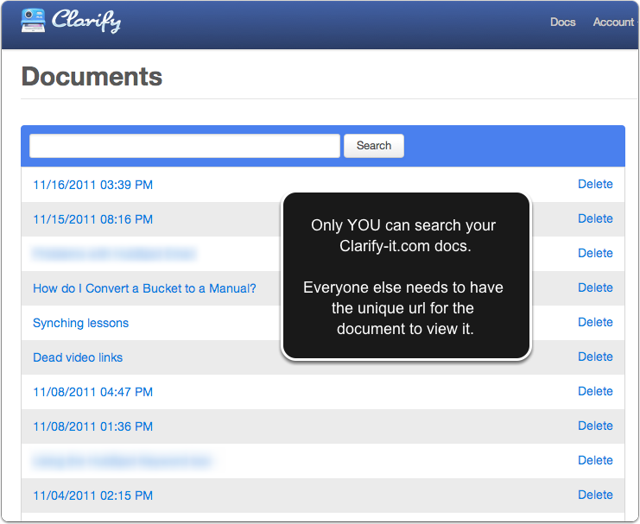 When you login to Clarify-it.com you will see a page where you can search for your documents. This is only for you. Non-logged in users can only see the page they have been sent to. They cannot search for documents.